One of the main issues I've focused on this session is helping former inmates successfully re-enter their communities. From finding housing to securing a job, these individuals face many hurdles as they rebuild their lives. 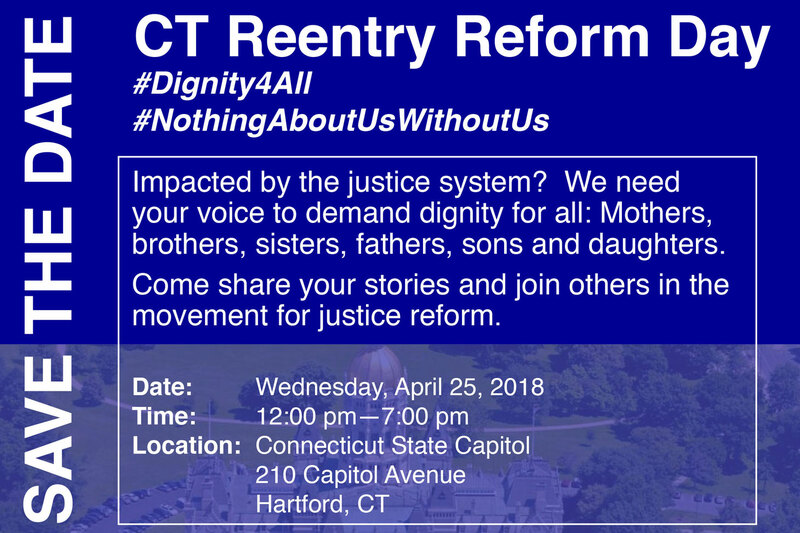 I hope you'll join me and other advocates for Connecticut Re-entry Day on Wednesday, April 25 at the State Capitol. We'll discuss these issues and rally for reform of the criminal justice system. Sign up here! This event is organized by the CT Re-entry Collaborative, a group of seven re-entry groups located in Bridgeport, Hartford, New Britain, New Haven, Southeastern CT, Waterbury, and Windham. Each group is a collaboration of state and local organizations working together to address gaps in services for individuals returning home from incarceration. The collaborative is coordinated by the Institute of Municipal & Regional Policy (IMRP) at Central Connecticut State University. The support of these advocates has been critical to moving forward legislation I proposed this session that would create a working group to study available housing options for ex-offenders and steps we can take to address the current lack of housing.